#19 on my 30 before 30 list is to make a decorative item for every holiday. Looks like I’ll have to step it up here in the last year of my list! I do already have a lot of Halloween decor, so I took to Pinterest to find something I didn’t have. Lately I tend to lean towards wreaths because it makes it a lot easier for people to find my apartment when they visit. And it just makes for a nicer welcome home every day! I already have a fall-type wreath, so I wanted to do something more Halloween-y. I got this idea from Pinterest but tweaked it a little bit. It only took a few hours and I think it’s super cute! And you could do this same concept a million different ways for various holidays, events, etc. 1. 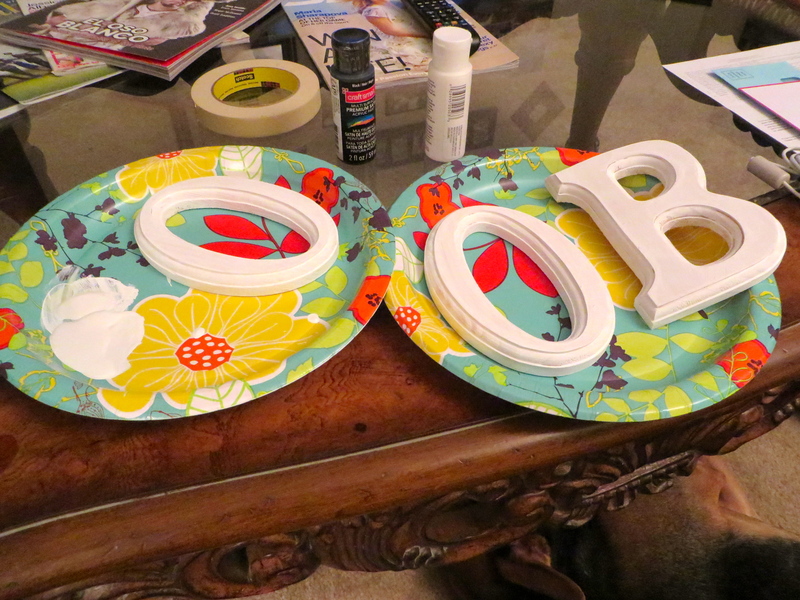 Paint the letters a solid color with acrylic paint. I use a small sponge paintbrush – it goes on nice and even. Let dry. 2. 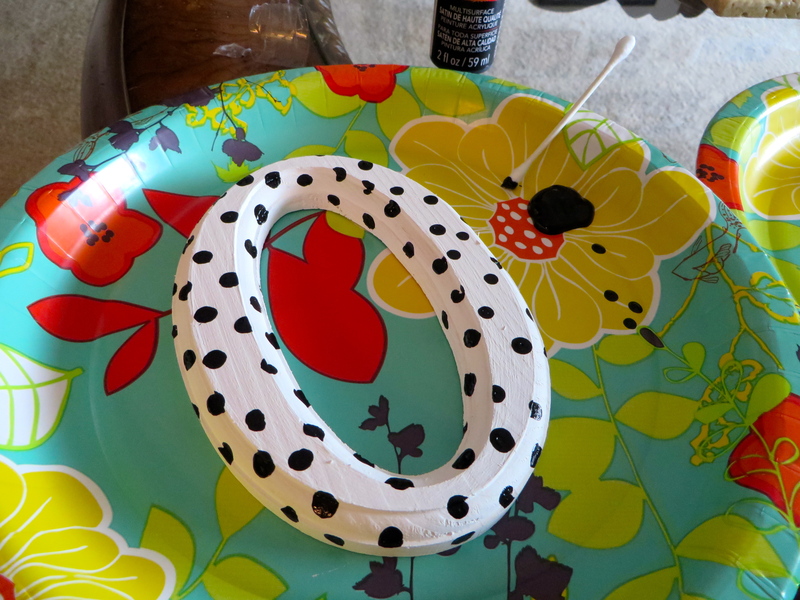 Use the q-tip and the second acrylic paint color to put polka dots on the letters. This is obviously optional. You could leave them solid, put glitter on them, paint stripes – whatever you want! 3. With the burlap ribbon, tie a large bow. I just googled ‘how to tie a burlap ribbon’ and found a very simple how-to. 4. 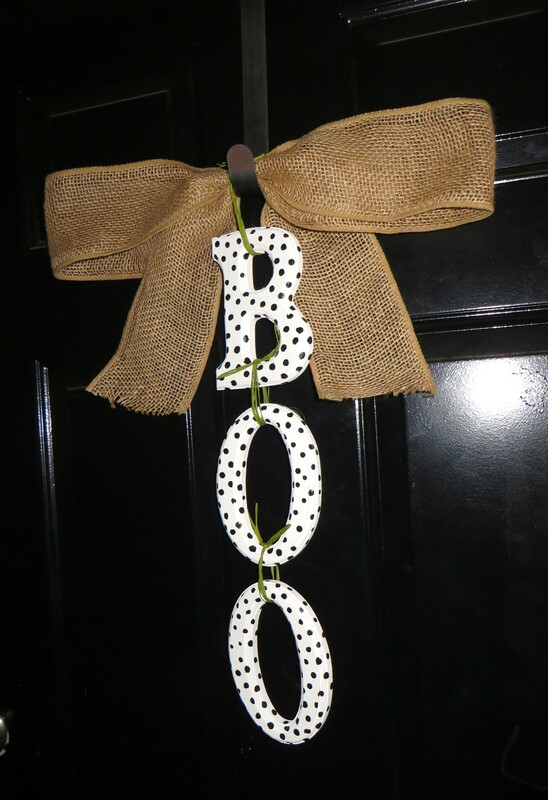 Use some of the raffia (or another ribbon) to secure and decorate the middle of the burlap bow. Then use more raffia to tie each letter together and to the bow. Categories: Wonderful Wednesday | Tags: crafts, decor, Halloween | Permalink.